Serving Newport Coast for over 25 years, Patio Place is your best choice for affordably priced patio furniture, barbecues, grills, umbrellas, gas logs, bar stools, and more, from the industry's finest brands. We are authorized dealers for Galtech, Fire Magic, Hanamint, Patio Renaissance, and other leading names, and receive first priority on their closeouts. In addition to the best deals in Orange County, we'll also provide you with knowledgeable, expert advice on everything we sell. From deciding whether to repair or replace our outdoor furniture to choosing patio pieces in the right style for your decor, we always go the extra mile to make sure you are satisfied with your purchase. We even offer same-day delivery to Newport Coast homes and businesses, which includes disposing of old patio furniture at no extra charge. 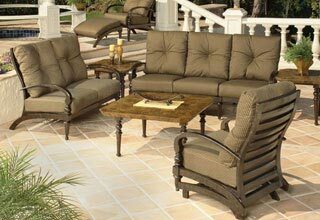 Patio Place provides Newport Coast with quality, brand name patio furniture at an incredible discount. From this year's patio furniture to the last season's models, we stock an impressive collection of extruded aluminum, cast aluminum, and wicker patio furniture that are as stylish as they are comfortable. Among our inventory are patio dining sets, patio lounge sets, bistro tables, benches, chaise lounges, deep seating, day beds, loveseats, ottomans, sectionals, coffee tables, console tables, garden tables, swings, and more, all at rock-bottom prices. Call or visit us today for trustworthy advice about the brands we sell, our custom-made replacement outdoor cushions, and same-day delivery to Newport Coast. For the best prices on brand name fire pits, fire tables, and bar stools, Newport Coast customers choose Patio Place. 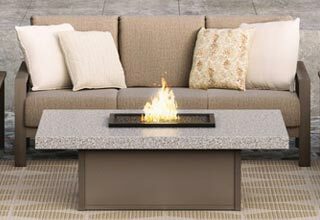 Attractive and functional, our fire pits and fire tables feature a wide selection of styles and materials, including granite, travertine, marble, and other attractive stones. Perfect for outdoor entertaining, fire pits can be enhanced with beautiful reflective fire glass or comfortable outdoor seating. We recommend bar stools from our huge inventory, which will perfectly complement fire pits of any height, shape, or style. To learn more about our bar stools or fire pits, visit today. 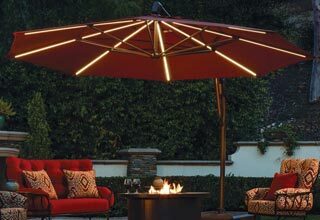 Come by Patio Place today and view our affordably priced, brand name patio umbrellas, including side post, auto tilt, cantilever, push to tilt, easy track, customized, and other styles. From 6 feet to 13 feet in diameter, our patio umbrellas will add the perfect amount of shade and a wonderful splash of color to your Newport Coast outdoor living spaces. We can also customize your patio umbrellas with our selection of attractive umbrella bases (up to 80 pounds in weight for high-wind areas) and intimate umbrella lights (available in plug-in or solar-powered options). 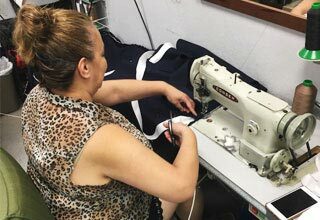 Silkscreening is also available from Newport Coast businesses who want to personalize their patio umbrellas with a personalized monogram or business name. We offer Newport Coast the best deals on brand name gas logs, grills, barbecues, BBQ replacement parts, and more. Available for the lowest prices in Orange County, our Fire Magic barbecues and grills come in multiple sizes and are available in gas and propane models. We can also remove and install common barbecue parts, such as lights, range hoods, warmers, access doors, and more, and sell a wide collection of outdoor cooking equipment, including kegerators, sinks, faucets, fridges, and more. We also sell a variety of ceramic gas logs, vented and unvented, as well as river rocks, reflective fire glass, and lava rocks. To learn more, visit us today. Do you need to replace your weathered or damaged outdoor cushions and pillows? Looking to replace a torn or faded patio chair strap or sling? Then look no further than Patio Place. With more than 600 quality fabrics to choose from, we can restore your fabric's original look and give your decor an updated appearance. We can custom-make outdoor cushions with Sunbrella, Phifer, or original manufacture fabrics, such as those made by Alu-Mont, and others. We can also custom-make replacement slings for patio chairs and chaise lounges, and build in extra padding for additional comfort. Call today to learn more about outdoor cushion and sling replacement services for Newport Coast customers. We offer low pricing and excellent manufacturer warranties.